Despite satellite-derived cloud imagery and even sea-surface wind data inferred from satellites, the weather information supplied by voluntary observing ships (VOS) is still invaluable to the marine forecaster. However, if the approaching weather system is a hurricane (tropical cyclone/ cyclone/ typhoon - all the same thing, different regional names)--making 'valuable meteorological observations' becomes of secondary importance to the master of the ship! Fortunately, in the Gulf of Mexico there is an offshore surface observing network which remains steadfast in the face of the storm. These are the moored buoys of the National Data Buoy Center (NDBC). The photo on the right is an example of one of NDBC's 10 meter discus buoys. 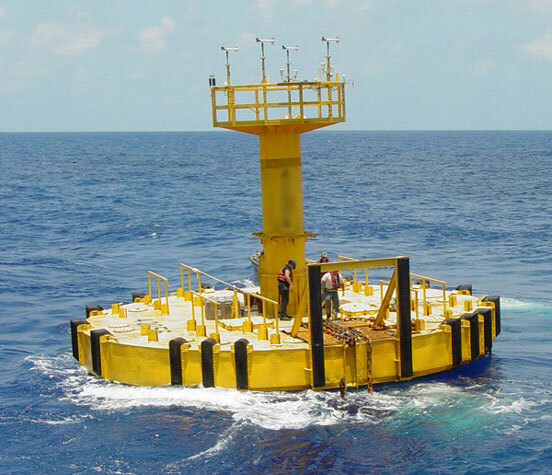 A similar buoy was situated close to the path of Hurricane Rita as she headed across the Gulf of Mexico in the direction of Galveston last Thursday. The maximum 10-minute average wind speed was 87 kt (161 km/hr) at 0030 UTC September 23, with a peak gust of 118 kt (220 km/hr) at 0021 UTC 23 September. Sea state also reached its maximum in the late afternoon--12 m (significant wave height--individual waves could have been 50% higher or more). The cost of maintaining even one of the smaller, 3m discus buoys at sea is considerable. Fortunately the major maintenance cost--i.e. ship time--is carried by the US Coast Guard. Tropical cyclones, the generic name for tropical depressions, tropical storms and hurricanes, spend most of their life cycles over open waters as immediate threats to mariners including Department of Defense personnel and assets, U.S. and international shipping and recreational interests, and subsequently to the many peoples and properties exposed to their forces at landfall and then inland. Surface weather observations over these vast waters are extremely sparse, limited to a few island stations and an occasional ship report. Reconnaissance aircraft fill some of this void, but this resource is generally available in limited numbers and areas, and can require about a day of lead time. Satellite-based observations can provide remote estimates of surface conditions, but are not yet reliable in areas of heavy rain, where information is often of greatest need. 1. When a tropical cyclone has formed or dissipated. 2. The extent of a tropical cyclone's wind circulation. This is important to forecasting wind speed and storm surge, for proper sizing of "watches" and "warnings" and for decisions on preparedness, including evacuation. 3. The location of the center of tropical cyclones, which is important to making track forecasts. 4. The height and distribution of ocean waves generated by tropical cyclones, which is critical to mariners. 5. The maximum intensity of tropical cyclones. This is important to preparedness, including evacuation decisions, and to mariners through the generation of dangerous waves. 6. The quality of the measurements and estimates obtained from remote-sensing reconnaissance aircraft and satellites.